Homefront: The Revolution might be fun, but I had trouble making that call during my 15 minute demo. I enjoyed driving a motorbike up ramps and over fences, but I didn't have much time to familiarize myself with its crafting and gadgets, and the demo at PAX was set up with an Xbox One controller, which I'm not used to with shooters. So, I couldn't aim for crap, and one time I drove a remote controlled car bomb into a patrol and accidentally backed out of its controls instead of detonating it. So I just drove an RC car up to a bunch of armed soldiers and then looked up and shrugged, essentially. I died running away. There's meant to be a focus on improvisational play in Homefront, where American resistance soldiers scramble through an open-world Philadelphia having skirmishes with the occupying Korean soldiers. For me, though, 'improvisation' meant running away while jamming healing serum into my wrist. I didn't cleverly modify my guns or disrupt patrols with explosives. I ran away from flying robots, feeling a bit confused as to why I'd want to be a rebel in futuristic occupied America. It was all pretty gloomy. 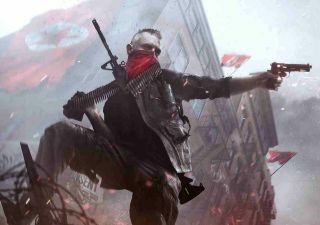 But I can't judge it well now, as games like Homefront are hard to demo quickly. I needed to be introduced to its environment and tools a little more gently if I was going to use them creatively and constructively. So, my lacking abilities in mind, I had a chat with senior narrative designer C.J. Kershner (which you can watch above) about the intentions behind Homefront. We also talk about the game's ride through multiple publishers, which has taken it from THQ to Deep Silver. Homefront: The Revolution releases spring 2016, with a multiplayer beta coming this winter.